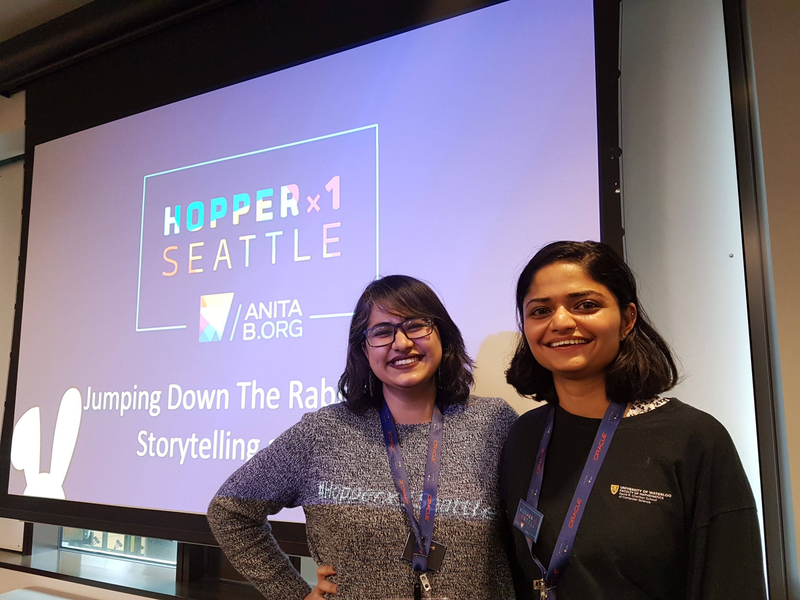 This year I had the privilege to attend Hopperx1Seattle on March 22/23 at Amazon’s Meeting Center. This was the second annual conference, a localized take on Grace Hopper Celebration that brings together women in technology at a global scale. There were approx. 1500 women and some male allies (wanting to learn how to be advocates for women). It was an inspiring and motivating experience to be in the company of so many leaders and mentors. The most amazing part was how approachable they all were. It was also an honor to have Falah Shazib from PWiC get selected as a speaker. The PWiC group also had a meetup on the 22nd to connect while they were there and were lucky enough to run into the CEO and President of AnitaBorg Brenda Wilkerson! I personally found this to be a great learning experience. Below I share some of the insights I gained from this 2-day of networking and learning. PWiC was proud to have their community member Falah Shazib present at the conference. Falah is a third year Computer Science student at the University of Waterloo. After being introduced to VR at GHC 2017, Falah founded and is president of UW VR, the first student-run VR/AR university club in Canada. She not only runs workshops and meetups for the club but gives VR lightning talks and is currently interning as a VR/AR and HCI developer. Focusing on introducing this technology to as many people as possible, she eventually hopes to use it for social good. Here, she presented a beginner workshop about Storytelling and VR by teaching participants how to build a short scene. It was a proud moment for PWiC to have Falah’s talk proposal get accepted from amongst so many applicants and to have her share her technical knowledge in VR with the community. Brenda Wilkerson from AnitaB.org and Sandy Carter from AWS started the 2-day event with the keynotes. The main theme was customer obsession and how we should be a continuous learner and use our voice to show who we are, be it your physical platform or social media. You deserve to be here and never be apologetic about it. Melissa Benua from mParticle talked about deploying code. Different Stages of source code, quality practices, deployment practices, monitoring practices, and what’s the impact of all this to the continuous deployment cycle. She suggested you first evaluate which stage you are at in each area and what is the target stage you want to achieve and go from there. Panelists Rebekah Bastian, Cynthia Tee, and Sue Taylor talked about career and how you can take control of it. They suggested to work on projects that interest you and how that helps the company grow. Make rich connections with a few people instead of making many connections. The most important learning I had from this panel is that it’s your own marathon, not a comparison with any one else. Your career might not be climbing one ladder in one career path. You can create your own path with many career choices and use the learnings from one career in the other one. Always tell a story of how your past experiences prepared you for the new experience you are aiming for. Katrina Browne from Microsoft talked about Data and AI and how it can have biases ingrained in them due to the way the problems are formed, and data is collected. In order to make sure we are engineering for equity we need to ask the correct questions at all stages. Panelists Karen Okonkwo, Tejaswini “TJ” Marathe, Denise Aguiler, Mariana Alper talked about how different backgrounds impact the career. They talked about valuing the voice of diversity employees esp. at a beginning level. Managers should help create connections and give resources about diversity group to the employees when they join. Be yourself, create your own lane. The end to Day 1 was full of inspiration with chat with Laura and Bridget. They were funny, prompt to response and full of wit. It was an amazing end to the most amazing day. In order to improve Laura suggested you need to get feedback especially the one that hurts. Feedback that hurts probably has something to it. Stuff that is irrelevant doesn’t hurt. Bridget had a more hands on approach for improving. She suggested to make a video of yourself, watch (may be with friends) and get feedback on the video. Learn how to improve going through this process. · Or look at all your successes so far. Panelists Ambika Singh, Nicole Buchanan, and Alice Steinglass talked about what’s the future of tech in Seattle. Starting from K-12 education all the way to startups. Inspiration at its best. For younger women and girls, all women in tech should act as a role model. Encouraging them and show them they can be good at coding and can have a career in CS. The boys are twice as likely to be told that they are good at computer science. You should not be a silent star, find yourself a sponsor. You are worth more than you think. Farah Khurrum is a first generation immigrant, a software developer and an accountant by education. She spent 13 years taking care of her 2 very active boys and volunteering for the school and school district. She started her career as a Software developer about 2 years ago. Farah is passionate about development practices, design patterns and cloud computing. She is an advocate of education, diversity and inclusion at the workplace, and enjoys helping and empowering others. She loves to create anything using tech!